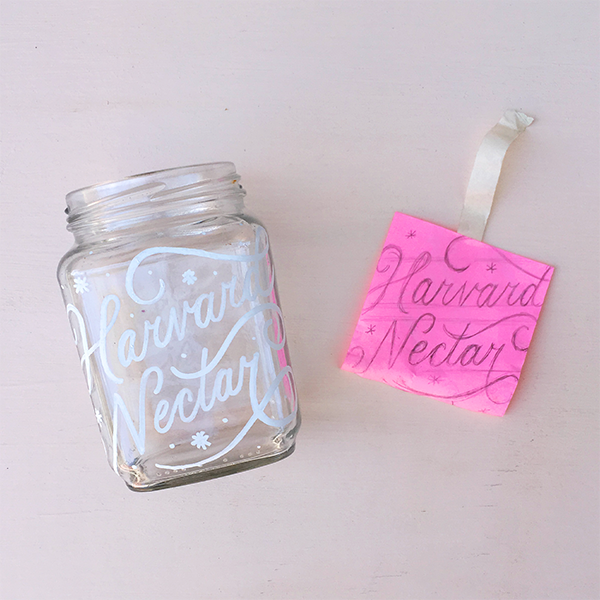 If your jar will be decor that won’t be handled much or that you want to be able to change up/clean off, try using a Posca Paint Marker (shown & used here). If you need something more durable, try using a DecoColor Paint Marker (dries shinier but won’t scratch off as easily). If you need something permanent, try using a Sharpie Oil-Based Paint Marker. Make sure your lines aren’t too light, as you’ll be placing the paper inside of the jar and tracing it through the glass. I prefer sketching darker and thicker lines so they’re easier to trace over. Don’t worry about making it too perfect; the most important elements will be the positioning and size of the letters. We’ll be using this as a guide for our paint marker. 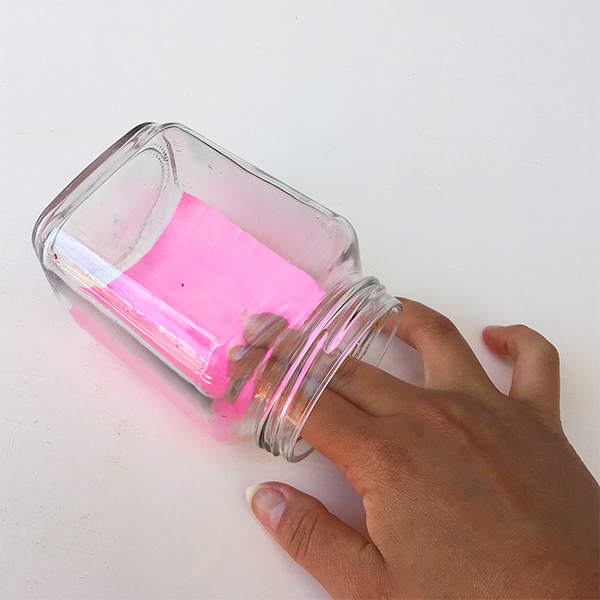 Using your fingers, gently guide the paper into the jar, working with its curves, and tape it in place. I used one piece of masking tape to secure my paper at the top because it was small, but if you have a larger sheet of paper, you might need to use a small piece of tape on each side of the paper to make sure it doesn’t move while you draw on the other side. Step 3: Using your pencil lettering on the inside of the glass as a guide, trace over it on the outside of the jar with your paint marker. To get your paint marker started, you’ll probably need to shake it up and press down on the nib to get the ink started. Follow the instructions on your pen to get the ink flowing through the tip. On another scrap of paper, draw a few lines with the marker to make sure there isn’t an excessive amount of ink on the nib before you start drawing on your glass. This jar is a joke from Ali Wong’s Baby Cobra stand up special on Netflix. I filled it up with honey for contrast against the white lettering on the jar when I photographed it. Keep that in mind when documenting your jar! Whatever color you choose for your lettering, make sure the contents of the jar contrast against it if you want it to be as legible as possible in photos. Step 4: Wait for the paint to dry, and then gently remove the paper from the inside of the jar. If you give this tutorial a try and post a photo to Instagram, make sure to tag me @homsweethom so I can take a peek at your work! And if you know a friend who would benefit from any of the goodies in the Creative Resource Library, tell them to sign up here and join the fun.